WHERE IS THE LAMB, PEOPLE?!?!?! This transition from South Carolina to New York has been pretty easy other than adjusting to the weather. 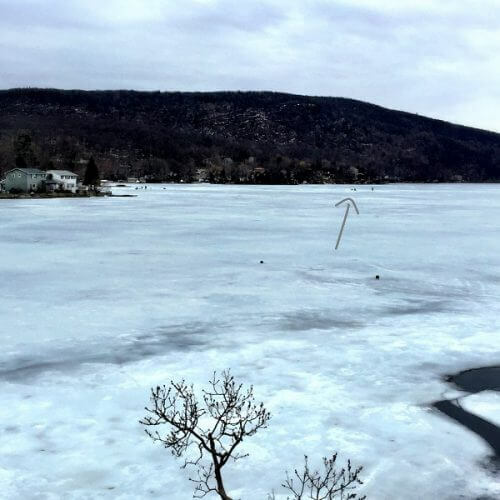 My friends in SC are posting pictures of their kids swimming in the pool already, and we’re still watching guys ice fishing on the lake out back. I give you Exhibit A – I literally just got up from the computer and shot this from the back door. Those specks out on the lake? Ice fisherman. Apparently that’s a thing here. Cozy, right? I can pretty much guarantee that you will never find me sitting on a 5 gallon bucket on a frozen lake, exposed to the wind and elements with a fishing pole in my hand. If I want some fish, I’ll drive down to the grocery store and choose from the wide variety they have on ice behind the counter – already cleaned by the way. I’ll probably get a giant coffee while I’m there and drink it on the way home, with my seat warmers on the hell fire setting and the heat blasting full force. Then I’ll put it in the fridge for later and help myself to some of this soup. Because I deserve it for having to go outside at all in this frozen wasteland. And so do you. 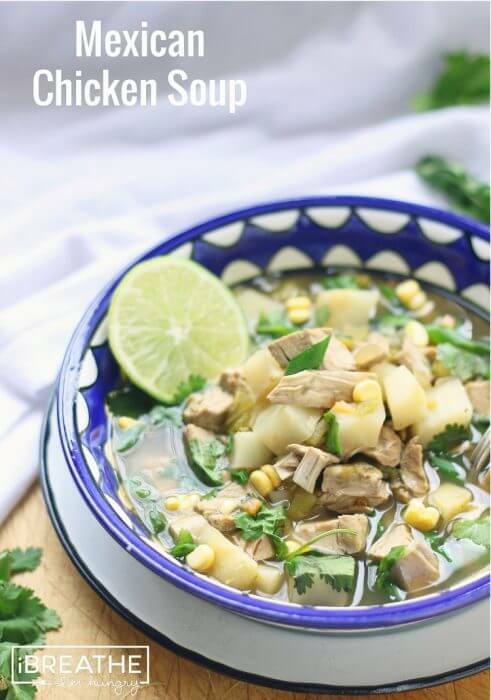 Whether you’ve got hungry ice fishermen in your life, or you’re just sick of being cold like I am, this soup will warm you all the way through. It’s spicy enough to make your nose run, but not enough to burn your tongue off. 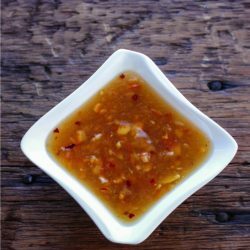 You can adjust it by using more or less of the habaneros. As an added bonus, it’s super easy to make, with very little chopping involved. Soup will always taste better made with homemade stock, but you can definitely get away with store bought chicken broth for this one if necessary, because it’s got so many other flavorful ingredients in it. To make it even easier, you can pick up a rotisserie chicken on your way home and just shred it up to throw in this soup – you can have it ready to eat in just 30 minutes! Did I mention it’s only 100 calories a bowl – that’s another nice bonus! In the past I’ve used cauliflower to stand in for potatoes in low carb soup recipes – and it works ok. Let me tell you though, I tried celery root in this one because I had some leftover after making this fantastic low carb Rosti, and it was amazing! So hearty and starchy feeling that you’ll think you’re eating real potatoes! I threw in some fresh corn because I like the flavor, but it does add a few carbs so I’m going to list it as optional garnish. 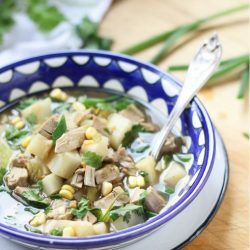 If you omit the corn, this low carb soup recipe is also Paleo, and depending on what tomatillo salsa you use (no MSG, Carageenan, or sweeteners), it’s also Whole 30 compliant. Either way, it’s delicious and satisfying – especially if you’re coming in from the cold. 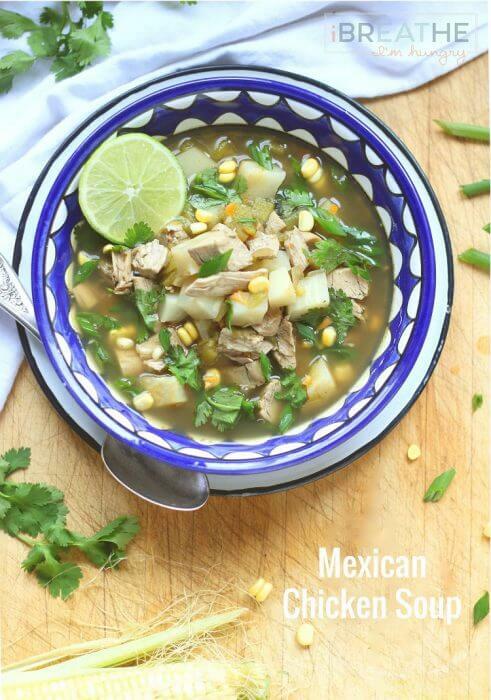 A low carb Mexican Inspired Chicken Soup recipe guaranteed to warm you no matter what the weather! Whole 30 compliant if you omit the corn. 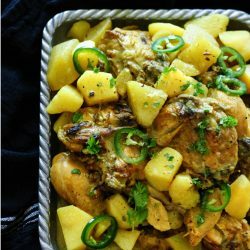 Combine the chicken broth, chicken, celery root, garlic powder, onion powder, ground cumin, green chilis, tomatillo salsa, and habaneros in a large saucepan. Bring to a boil, then lower the heat to medium and simmer for 20-30 minutes. Add the cilantro and scallions right before serving. Garnish with fresh corn, sour cream, lime juice, or more cilantro and scallions if desired. I find that I make this recipe about twice a month and pre-measure it out for my lunches. It always tastes so good. 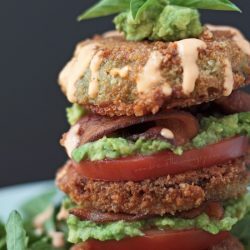 Is this recipe Keto with the celery root??? Melissa, I inadvertently landed on this recipe and I’m so glad I did. It was my LOL for the whole day. I wish I had seat warmers with a Hellfire setting! Your post for the Pistachio Truffles caught my eye (they look wonderful….will be making soon) and started trolling your site for good soup recipes, because, duh….sooooo cold. Made this and just finished scarfing down a bowl….SO GOOD!!!! Using the celery root was inspired….so mimics potato with far less carbs and great fiber. Added a whole 2 Tbs of frozen corn per serving….also well worth the carbs. I had half a cut avocado from yesterday so I added it diced along with the cilantro and scallions. Really delicious….will be having again for dinner as well. Love love love it. Have been a fan of your recipes for a good while (esp the meatballs ….yum) but this is the first soup. Certainly not the last…..we will be burning up the printer with IBIH soup recipes for the rest of the afternoon. Don’t want to miss a one. 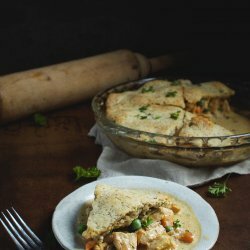 I made a variation of this recipe today and was very impressed. I left out the jabañero, as my DH isn’t so much on super spicy, and we were still left with runny noses. 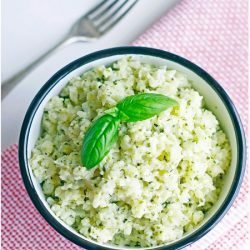 The major change I made was using chayote squash instead of celery root. It has fewer than half the carbs of the celery root (according to Wikipedia) and absorbed the flavors beutifully. 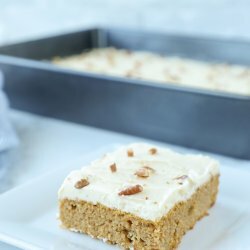 Thank you for publishing this recipe? It will be a go to for me. You picked a terrible year to move to NY. I’m so sorry! I live here too, upstate. Brrrrrr. This soup looks perfect to warm me up this week. I’ve been anxious to try celery root and this looks like a good way to sample it. Thanks Karen, I know it will warm up eventually but this is ridiculous! The soup is fantastic, and yes, the perfect way to dip your feet into the celery root waters! 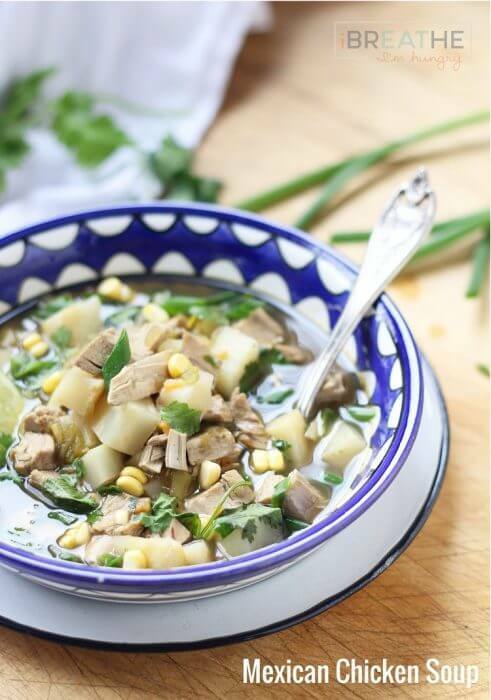 It soaks up the flavors of the soup when cooking and is just delicious! My other favorite way to make it (so far) is in the rosti recipe which is crunchy and so satisfying! 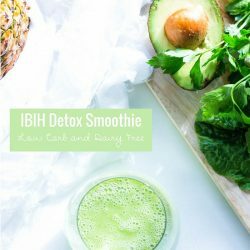 Let me know what you think if you try it!!! This looks like pure pleasure in a bowl. I will to try this soon!! Thanks so much Carole, hope you love it as much as we did!